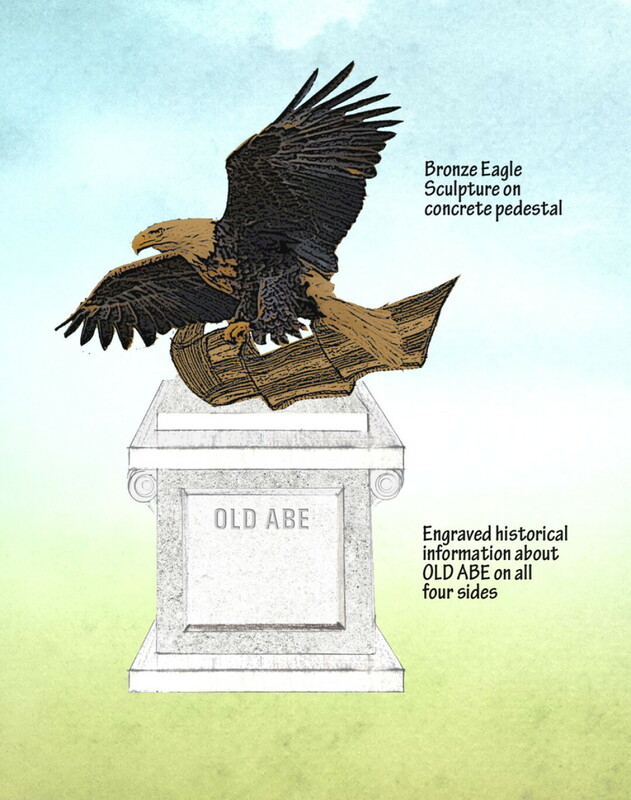 Plans to create a veterans memorial trail in downtown Eau Claire include a statue of Old Abe, the legendary (but real!) bald eagle who accompanied Wisconsin troops during the Civil War. A group of veterans and civic leaders are working to create a memorial trail in downtown Eau Claire that would provide a space for people to learn about and honor those who’ve served in America’s wars. The roughly 1,300-foot tribute trail, which would run along the east bank of the Chippewa River between Madison Street and the city shops, will cost an estimated $2 million and could be completed by 2019, supporters say. The city has long planned to build a trail there between the High Bridge (which carries pedestrians and bicyclists over the Chippewa River) and the Madison Street bridge (which the trail would pass under to connect to Phoenix Park). 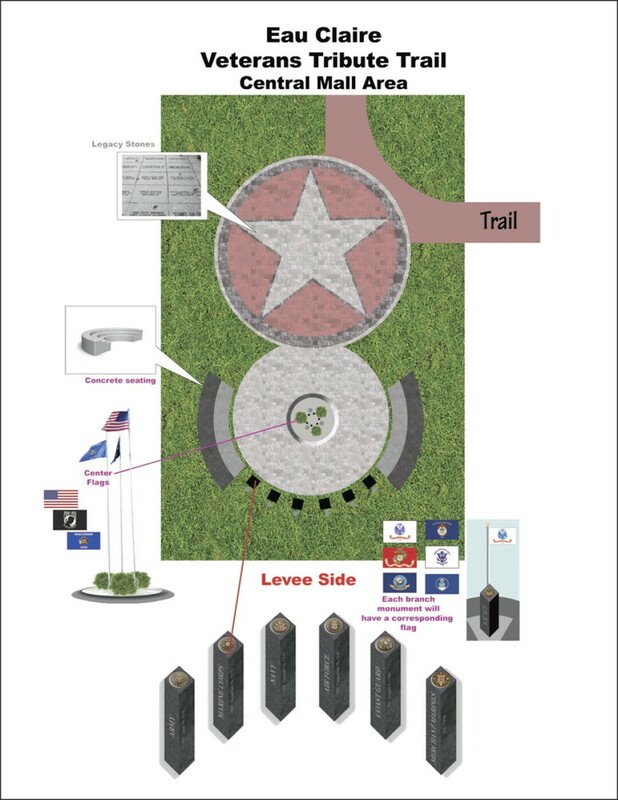 The veterans tribute would include a flag display and ceremonial area to the side of the trail, as well as a statue of Old Abe, the famed bald eagle who accompanied Chippewa Valley soldiers during the Civil War; decorative lighting, benches, and flowering trees; and a timeline and historical stations to educate visitors about America’s military conflicts. With encouragement from the county board and others, Beckfield began to pursue a permanent location for a veterans park that would be accessible, visible, and expandable. Veterans who support the effort said they wanted a memorial that would honor their service, not the weapons they used. (Beckfield explained they had seen enough weapons while they were in uniform.) They’ve also asked for something that would honor the flag and educate the public about their service and the nation’s history. Beckfield said plans call for the trail to be mapped with GPS technology, allowing anyone with a smartphone to learn about local connections to American conflicts from the Civil War to the present day. The City of Eau Claire and the Eau Claire Veterans Tribute Foundation – the nonprofit group formed to pursue the effort – have been negotiating a memorandum of understanding about the trail. If negotiations concluded as expected, the Eau Claire County Board was slated to vote on a resolution supporting the project on April 18. The following week, the city Waterways and Parks Commission will vote on the plan, which will go before the Eau Claire City Council in May. If the necessary approvals are granted, construction could start in late 2018 with completion in 2019. Beckfield noted that the city already plans to build the trail connecting the High Bridge to Phoenix Park, with or without the components honoring veterans. The latter work will be paid for entirely with privately raised funds, and supporters are optimistic that donors will be generous once fundraising begins in earnest. “If there’s a veterans project that needs to get done in Eau Claire County, it’s going to get done,” said Adam Kohls, Eau Claire County’s assistant veterans services director, referring to community generosity for veteran-related initiatives. Kohls said he’s heard overwhelming support for the project from veterans groups he’s spoken to. To learn more about the project, call (715) 828-4441, email markbeckfield@yahoo.com, or write to Eau Claire County Veterans Tribute Foundation, P.O. Box 252, Altoona, WI 54720.